Parent Gamer: Portal 2. For Science! 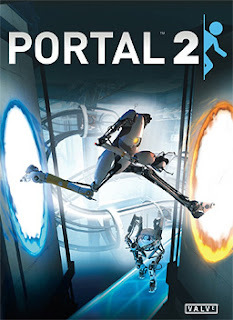 Portal 2 is a first person Puzzle-Platformer game where the player assumes the role of Chell, a woman trapped in a rundown scientific testing center called Aperture Science. Chell is “being tested” by being forced to solve a number of physical puzzles using a Portal gun, a device which allows the player to create transportation doors. The player has two portal colors. She “shoots” a blue door on one wall and an orange door on another wall. The player can then step through the blue door and come out the orange door. The player has to choose where to place the different doors in order to solve each puzzle. The puzzles are challenging without being impossible. They teach problem solving and some physics. The dialog in the game is quite humorous as well. At times I would stop before completing a level just to hear what the characters may say. It’s fun, entertaining, and clean. Though there are a few things you should know about. The game is rated everyone ages 10 years and older for Fantasy Violence and Mild Language. The violence level is not high in this game. In fact, aside from the occasional robotic turret and the end boss who is a computer, the player cannot harm anyone. Mostly the “Fantasy Violence” comes from what can happen to the player herself. Machinegun Turrets, poisonous gasses, toxic water, long falls and large crush-plates make up the dangers. If the player falls into these traps she will be quickly sent back a check point. The game does not show the character die, instead the screen will either fade to grey (in a fall) or tint red (when shot or smashed) and then the player will be unable to move, indicating a death. As far as violence goes, Portal 2 is quite tame. I would recommend this game for any kids old enough to understand sarcasm. However, there are also a number of times when Glados tries to taunt Chell by saying that she was adopted, which Glados relates to being abandoned by her parents. So parents will have to decide if this joking would be understood properly by their children. Beyond the cutting humor, I think this game can be fun and educational for kids. There is also a co-operative mode which allows two players to work together to try the same types of puzzles. This is even “safer” play since there is no Glados, and the players play as robots: P-body and Atlas. Because both players are robots, if they are destroyed, they just re-appear new and unscathed. Portal 2 is fun and entertaining. I would thoroughly recommend this title to any parent of gamers. Fun gameplay, challenging puzzles, interesting story, cooperative play, and a pretty kid-friendly play environment make this game a definite buy.